We take quite a fair bit of time curating some of the best watches to grab on Aliexpress. These sellers are vetted and designs are handpicked by our team here at Tollotoshop.com. Hope you like our review on the Aliexpress Watches for Ladies and Guys. If you are looking for convenient shopping, AliExpress is what you are looking for. The online retail shopping place offers awesome products at affordable prices. There is a wide variety with speedy delivery these days. Watches are one of the must-have trendy accessories for every fashion Guru. If you are looking for some out of the box shopping on watches that is also light on the pocket, AliExpress is where you should shop. Ladies and Men, you should really read our review on watches from Aliexpress. Check out the Top 10 Watches that you can purchase from Aliexpress. Come in 5 different colors. This clean cut skelenton watch is a perfect gift for men. Comes in 2 major different colors, this watch is a must get for sports guy who loves chronography watches. This is rubber strapped so it can apply to most of the function. For sport, for work. Available in 8 different colors, the above are 5 of the 8 designs. This watch seems like a Rolex replica. Costing less than US30, this is one of the good watch recommended by Tollotoshop. This waterproof, round, smartwatch, compatible with both iOS and Android. The watch also works as a phone, Bluetooth, Pedometer, and Heart Rate Monitor. It also serves the purpose of a calendar and remote control. Essentially a sports watch, K88S is made of alloy with a leather band. It supports various languages like English, Russian, Spanish, Polish, Portuguese, Turkish, Italian, French, German, and Norwegian, among others. This smartwatch has a traditional classic watch design with a super smartwatch experience. Do note that the there may be a slight color variation between the actual product and the pictures provided. The watch is delivered along with a USB Charging Cable, a screwdriver, four screws, and a user manual in English. Available in 3 different straps. Available in either leather strap or metallic strap, this watch is one of the most trendy watches we found on Aliexpress. It has multicolor for you to choose from. Cost is affordable. 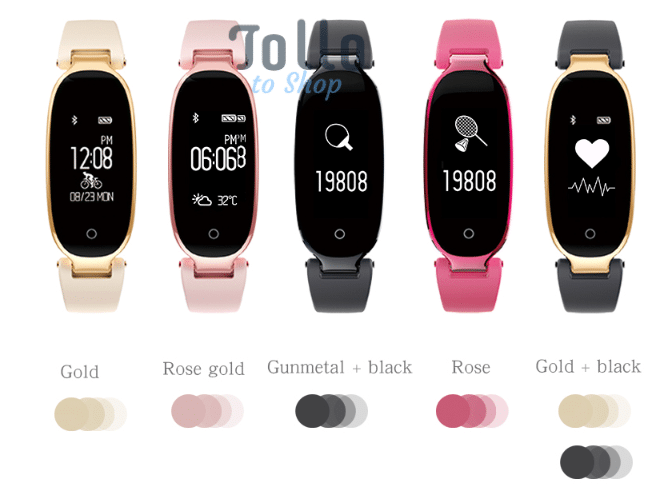 Soprt S3 has won hearts with its Bluetooth smartwatch. The watch is a multifunctional wristwatch for iOS/ Android and is compatible with smartphones and electronic wearables. This electronic wristwatch is made of alloy and rubber strap. It is not only fashionable but efficient too. The watch can double up as a passometer, fitness tracker, sleep tracker, message reminder, call reminder, chronograph, permanent calendar, heart rate tracker, remote camera, and music player. The watch also allows people to make and answer calls. With a capacity of 200mAh, the watch supports the English language. This amazing watch will surely serve as a great gift for family and friends. The Bozlun is a Bluetooth smartwatch. This wristwatch doubles up as a fitness tracker, sleep monitor, camera, alarm, and also allows the user to make and attend calls. Compatible with both iOS and Android, this sports watch is water resistant and fashionable. With a rubber band, the watch supports emergency calls too. It has a highly sensitive capacitive screen. The watch supports many languages, including English, Russian, Spanish, Portuguese, Turkish, Italian, French, and German. The watch helps sync your calls and messages with your phone and also allows you to control music. With a capacity of 120mAh, the watch comes with USB charging cable and a charging cradle. Civo’s Quartz Wristwatch is amazing. This stainless steel wristwatch looks like a bracelet and is specifically designed for women. With a hardlex dial window that measures 32mm in diameter, the watch sports an 18cm band length. The watch is available in Four Different design. It is analog in nature (with diamond-like German Hardglass) and is an absolute beauty! The best part is this watch water resistant. You can buy this stylish piece of the accessory here. Wow, what a watch and what a brand name. DOM. This watch is so outstanding! No one will ever think this is a $10+ watch. You have a quality zinc alloy case, quality leather strap, a 30m water resistant clock at a very affordable price. Get this designer watch before they are snatched from the store. The Geekthink watch is a quartz wristwatch-bracelet made of alloy. The watch is waterproof and sports a military-sporty look. Made of high quality, the watch is running on Citizen 2035 Japan Quartz. The design is unique. Such a simple minimalist watch! The watch has an elegant and contemporary design. It has a band length of 23.5cm and is available in 3 colors. These days it takes so quick to have a parcel delivered to your doorstep if you purchased from Aliexpress. Most of the guys out there set up dropshipping business for this aspect. Here we have these items curated for you without any profit margin. We do earn a tiny affiliate fee if you purchased. So do support us by reading our reviews.